I can’t stand books that intentionally seem to break out the violins and Kleenex just for the sake of inducing tears. I can’t love a so-so story simply because it is sad, its got to hold its weight in terms of an actual plot line and characters that actually DO something for me. This was one such exception. 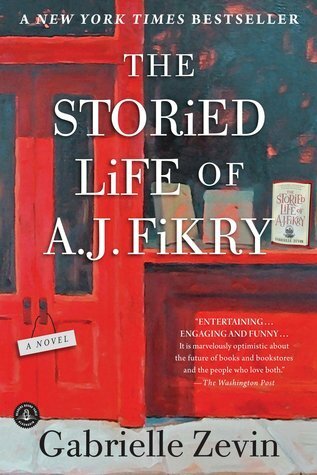 This novel is the story of A.J. Fikry, a widowed curmudgeonly middle-aged man who owns an independent bookstore on a fictional small New England island. Sales are down, and A.J. spends most of his time chasing away his customers and drowning his sorrows in alcohol. He is content to live this life in this manner until one day when a mysterious customer abandons a small child in his bookstore. He eventually adopts the little girl, and his entire life turns around for the better. This would be well and good if this book weren’t so, I don’t know…cheesy? There are several plot twists and turns that just seem to be there because they’re well…there. The dialogue all throughout was somewhat contrived, and the characters never rose above behaving exactly as they were ‘expected’ to. However, when I got to the end of this book, I was actually crying big ol’ crocodile tears. This is ultimately a book lover’s book. Once you take this into context, the pieces of the story I didn’t like really did not matter in the grander scheme of novel. I chose the quote above to begin this review because aloneness and the desire to be a part of something is the reason I found hours of pleasure reading as a little girl, and thirty years later, it is the reason why I still love reading today. There are thoughtful literary references all throughout the book from stories that I’ve read before and I completely related to. This book takes the love affair that we book nerds have with indie book stores and ups the romance factor 100x, and for that reason (given that I now have to drive 30 minutes from home to find a bookstore that’s not connected to some corporate chain), this gets four stars from me. This book is not perfect, but it’s a book that makes you feel wonderful, exciting things in wonderful, exciting ways. Yassss…. I need to read this book because I too am a huge reader! I can’t wait:) I’m glad you enjoyed it! Great review. Previous Previous post: Thank you. Thank you. Thank you.